The crater's diameter is about 90 feet (27 meters). From the small amount of erosion or filling that Orion Crater has experienced, its age is estimated at no more than 10 million years. 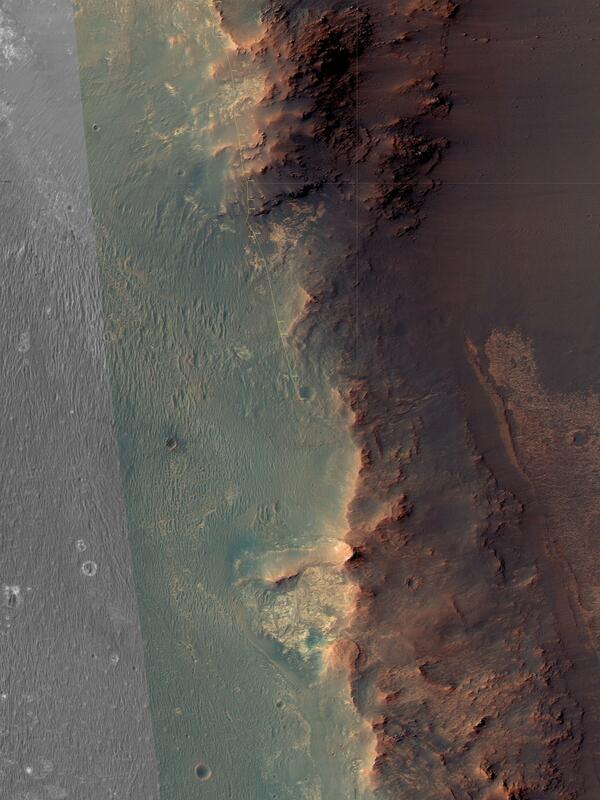 It lies on the western rim of Endeavour Crater. For comparison, Endeavor is about 14 miles (22 kilometers) in diameter and more than 3.6 billion years old. This view combines multiple images taken through three different Pancam filters. The selected filters admit light centered on wavelengths of 753 nanometers (near-infrared), 535 nanometers (green) and 432 nanometers (violet). The three color bands are combined here to show approximately true color. The component images were taken on April 26, 2017, during the 4,712th Martian day, or sol, of Opportunity's work on Mars. The rover's location on that sol, during its approach toward "Perseverance Valley" on the Endeavour rim, is indicated on a map at https://mars.jpl.nasa.gov/mer/mission/tm-opportunity/images/MERB_Sol4711_1.jpg as the endpoint of the Sol 4711 drive. Apollo 16 astronauts John Young and Charles Duke flew in the Orion lunar module to and from the first human landing in the lunar highlands while Ken Mattingly orbited the moon in the command module, Casper. On the moon, Young and Duke investigated Plum Crater, which is approximately the same size as Mars' Orion Crater. For more information about Opportunity's adventures on Mars, visit https://mars.nasa.gov/mer.